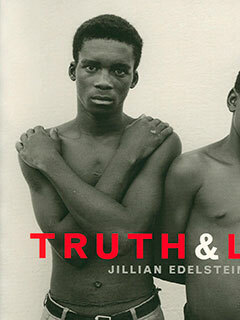 Jillian Edelstein was born and grew up in South Africa. She began working as a press photographer in Johannesburg on the Rand Daily Mail and the Star. In 1985 she emigrated to London to study. She has worked as a freelance photographer since 1986. Her portraits have appeared in magazines and newspapers including the Sunday Times Magazine, the New York Times Magazine, Vanity Fair, Time, and the New Yorker. She has received a number of awards including the Kodak UK Young Photographer of the Year in 1986 and the Visa d'Or at the International Festival of Photojournalism in Perpignan in 1997 for her early work on the Truth and Reconciliation Commission. Her photographs have been exhibited internationally at venues including the National Portrait Gallery, London, the Photographers’ Gallery, London, the Rencontres Internationales de la Photographie in Arles, France, and the Bensusan Museum, Johannesburg. She is a member of Network Photographers and she lives with her two children in London.